HOLY COW, IT IS 2014 AND THIS IS MY FIRST POST OF THE YEAR! HOW EXCITING! 🙂 Since the occasion is so important, I gave this post a lot of thought. 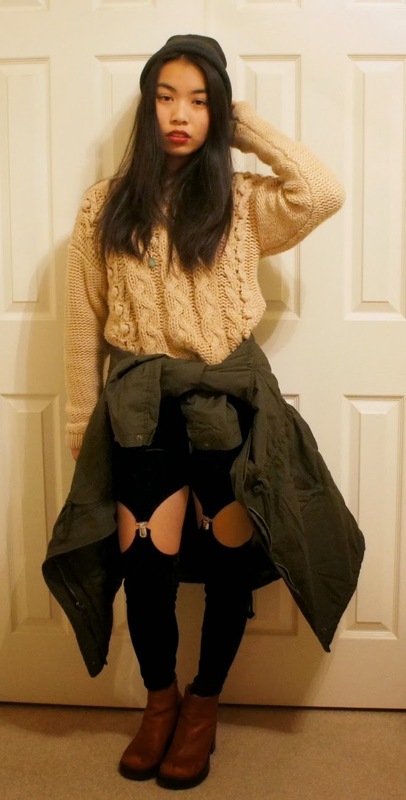 I definitely wanted to do a winter haul and I was going to showcase each item in a different outfit, but what if I combined everything I got this break and solely this break into one outfit? Each item was purchased at a different store at a different time. Does the combination work? You can be the judge of that. Furthermore, each item I purchased this break is practically an essential in my book…especially for the winter. I might as well address the elephant in the room first. Yes, a pair of sunglasses is still relevant in the winter and so is your sun screen because even though the weather may be gloomy, the sun is still there. Also, if you are like me, then a pair of sunglasses is your second weapon of choice when it comes to allergies (first weapon of choice being allergy meds, of course). Windy winter days are thee worst. My allergies act up during the winter and they continue into the spring. I might as well look good on the outside if I am going to die in the inside. I got my pair of sunglasses from Forever 21 for $2. The most important winter essential item is definitely a coat. This should be a no brainer; it’s cold and a good coat provides great warmth. I just picked up this cinch-waist canvas coat from Old Navy for about $21 on clearance (original price was about $70, ouch!). I have been looking high and low for one of these bad boys for some time now. 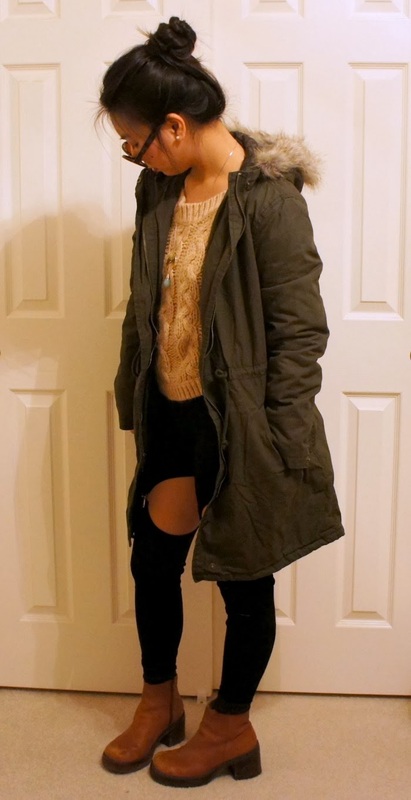 The drawstring in the coat gives a nice A-line silhouette that is oh so flattering. In addition to a warm coat, I would like to stress the importance of a big ‘ol bulky cable-knit sweater for a good deal of warmth. I have a bunch of thin sweaters, but thick sweaters are thee bomb. If I can wear this sweater every single day for the rest of the season, I would, but that would be impractical and very unsanitary. I guess I have to buy more! Tehee. I got this one at Thrift Town for $0.75 thanks to one of their promotional sales. 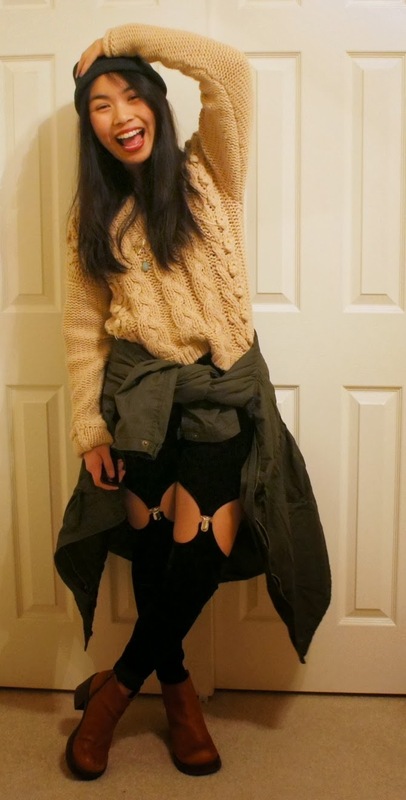 As for my bottoms, I would wear this pair of F21 leggings with suspender accents if the weather is kind to me. If not, then I would wear a skirt along with it or swap it for some pants/jeans. I have been meaning to DIY a pair, but I found it at F21 for only $4, so I couldn’t pass it up. It is definitely out there, but since my outfit is almost covered from head to toe, I thought a bit of skin wouldn’t hurt. Now to my favorite part of any outfit–the shoes! I actually got this pair of Candie’s boots today at a garage sale for less than $1. The pair is a bit beat up, but I still see the beauty in it. I mean, the color is gorgeous. It’s like a chestnut-like color. It also gives me a bit of height and that’s always a good thing. Oh, I almost forgot; I am wearing jewelry this time around. I own a bunch of jewelry, but I usually forget to wear them…oops. If you click on any of the pictures, then you should be able to see a necklace with a fan pendant that I got from Hobby Lobby for $3 with their 50% off deal. Hobby Lobby sells beautiful jewelry and DIYing them can be as easy as finding a gorgeous pendant and chain. I may not be a huge hat person, but I am starting to love beanies because they keep my head warm. They are also a plus for rainy days where you forgot to wear a hoodie. Been there, done that. I picked up this grey beanie for $2 at a flea market. My ten cents #31: I may sound like a hypocrite for saying this because I own a LOT of clothes, but I am going to say it anyways–you do not need a lot of clothes for a good wardrobe. 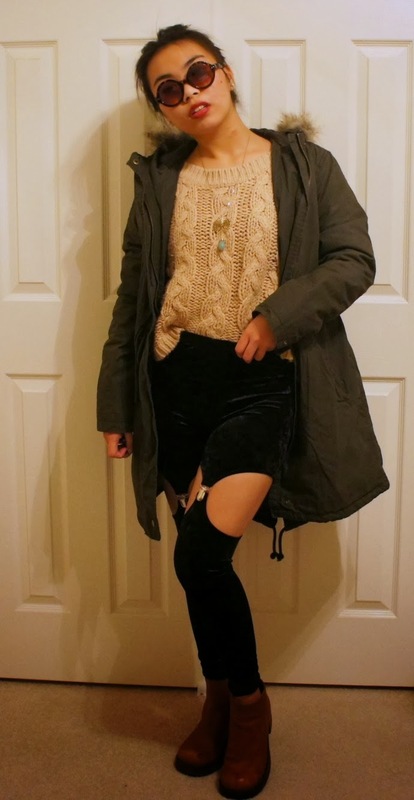 I am practically wearing the same thing twice for the two sets of pictures, but they look a tad bit different because I swap the accessories and I tied my coat around my waist. I changed my hair from being up to being down. It’s really that easy to jazz it up.